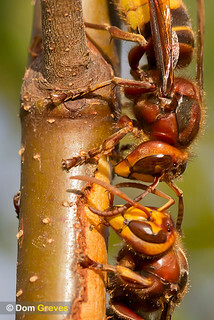 Hornets (Vespa crabro) stripping bark and feeding from birch sapling. Surrey, UK. 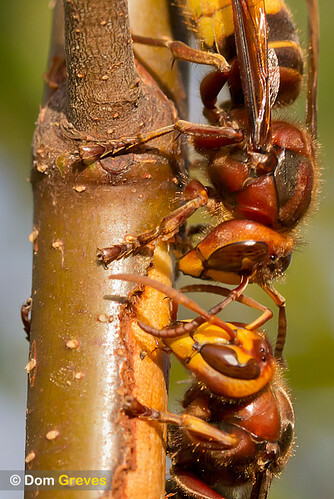 Hornets collect wood fibre and mix it with saliva to form the paper needed to build their nests. They also drink the sugary sap released for energy. I think the second hornet on the scene was more interested in the sap than the raw material. Interestingly birch sap is also a traditional beverage in Russia where it's commercially available in bottled form. In a concentrated syrup it has antiseptic, anti-parasitic and anti-inflammatory qualities.